Oh, happy Monday! Try not to dread it. It's another week that you can make great things happen. 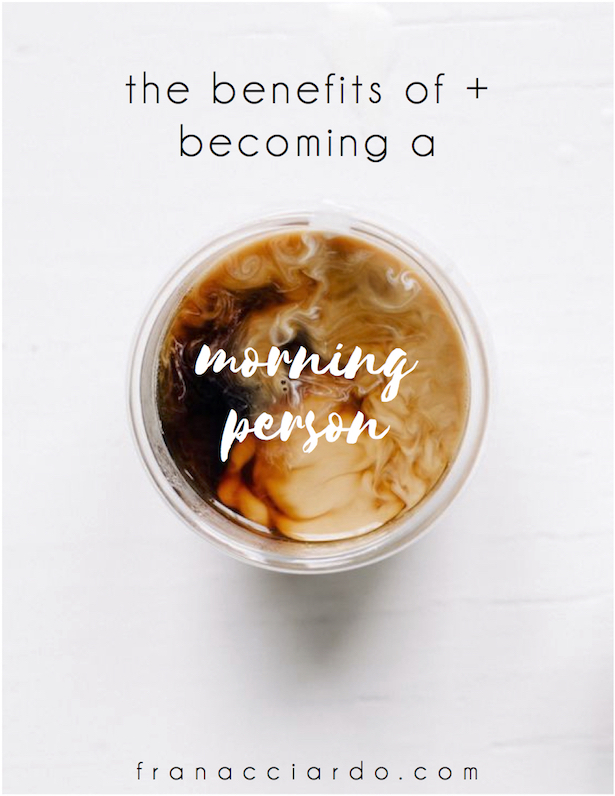 I've briefly mentioned a few times that I am a morning person, but I have never really chatted fully about the benefits and how I came to be the kind of person who thrives in the AM hours. I would say I came to this realization last year at school when I would consistently wake up before my alarm, but I continued to notice this summer that some of my favorite moments of each day were the simple moments spent running through my morning routine. I find mornings so peaceful and satisfying, and I want to share a few tips that might motivate you to become a morning person too! I think something that helps for me in particular is that I am one of those people who can still function at 100% on little sleep. There are nights when I'm in bed by 11pm (which I would say is pretty typical), but there are also nights when I get distracted on my laptop or phone, or I stay out too late with friends, and I don't go to bed until 2am. Yet, no matter what time I wake up in the morning (often between 6 and 9am, rarely any later), I will be excited and ready to start my day. Being more productive // You know how people often say, "there aren't enough hours in the day?" Well, how often do you just hang out in bed or lounge around until really, there are enough hours left in the day?! I know for me, when I wake up early, I can start getting ahead on some things I wanted to accomplish, or even start doing some things I wouldn't otherwise set out the time for. This might mean getting a jumpstart on assignments on a busy Sunday, or it might just mean adding an extra walk into my day or taking some time to clean my room-- things I might skip, but now I have the time for. Setting up for healthy success // Breakfast is the most important meal of the day. Research can't tell us enough! Boosting your metabolism is one thing, but did you know that if you start your day off with a healthy breakfast, you are less likely to reach for unhealthy foods throughout the rest of the day? Being a morning person for you might mean more time to have a real meal for breakfast, full of nutrients and healthy ingredients to start your day on the right note. For me, being a morning person means I am automatically in a healthy mindset when I wake up every morning that I have the motivation to reach for a greek yogurt or to make scrambled eggs, rather than choosing something high-sugar or sans protein. So... how did I become a morning person? My senior year of high school I woke up randomly a handful of mornings at 5:30am and went to the gym before school started. I could only get myself to do this infrequently, but I always noticed on those days that my mind felt clearer throughout the day and I had more motivation to make each day great when it started off on a great note. Living 30 minutes from my high school and forced to be in attendance at 7:50am meant it was probably the last time in my life I'd have such an early wake-up call. Even adults with real-life jobs don't need to be in an office before 8 or 9am, and a 30 minute commute isn't always the case. As summer came around, I didn't have to go into work until 10 or 11am, so I would usually be up by 8 anyways and using those couple of hours to fit in a run, shower, and try a new smoothie recipe or make myself breakfast. The more I did, the more I realized how much I loved celebrating the small things in the early hours of my day, when things are peaceful, stress-free, and overall less hectic. As college came around and my days either started at 9:15 or 10:45, I usually woke up hours before class and didn't want to just awkwardly chill in my bed while my roommate was still sleeping. I would usually work out in the mornings before class, and again, found it so much easier to fit in my day when it was already over and done with by the time things got crazy, assignments needed to be accomplished, etc. This summer even working a 9-5 internship, I got a feeling for what it really meant to be in a complete routine, and I knew if I didn't work out in the mornings or start my day off on a positive note, I would be so tired by the time I got home that nothing good would come of my day. Drink water right away // I keep a bottle or a glass of water right next to my best so I can hydrate as soon as I wake up. If you think about it... how would you feel going without water for 7-8 hours in the middle of your day? Groggy, cranky, and tired, right? So at night when you go without water, you are left waking up feeling a little out of it and lazy. Drinking water and hydrating your body right away is one of the best things you can do to get going! 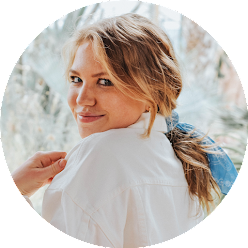 Find something to look forward to // Whether this is an extra workout (eh, probably not..), a yummy breakfast or trying a new recipe, or even an outfit you're excited to wear, find something that is going to make you excited to jump out of bed! Fall asleep feeling good // I love spritzing my favorite pillow spray on my pillow and sheets before heading to bed, making a cup of tea, and sometimes even reading a chapter of whatever book I'm into at the moment. Fall asleep relaxed and comfortable makes all the difference in waking up refreshed! Are you a morning person? Do you have any tips? Loved this post! I used to be such a night owl, but I am so productive in the mornings so I've slowly transitioned to becoming a morning person over the past year and it's definitely improved my life as a whole. I always have an amazing day when I wake up early. I need to do it more often. I love doing a little bit of yoga right when I wake up. Love this! I slowly turned into a morning person this summer as I had to be up at the crack of dawn for my nannying job and I still like to get up on the early side so I can get more done during the day! I love this!!! mornings are by far my favorite time of the day- waking up can be a struggle, but once i'm up I feel much more productive!